The skies over Occoquan Bay National Wildlife Refuge were busy yesterday with ospreys carrying sticks for their nests. 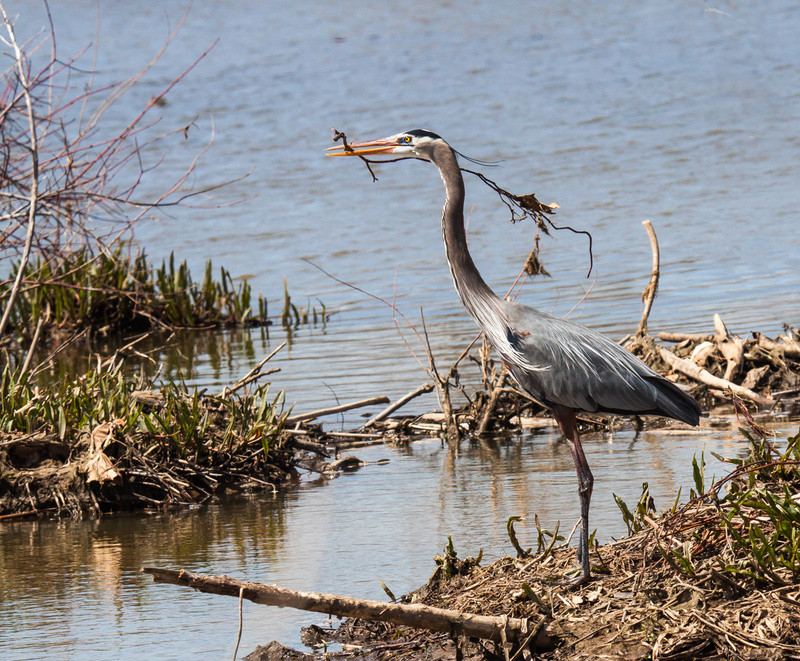 A Great Blue Heron (Ardea herodias) joined in on the action and carefully checked out a lot of sticks before choosing a perfect one. A few seconds after this photo the heron flew off to an as yet unknown nesting site. Benjamin is always excited to see the birds carrying sticks in their beaks for nest building. He doesn’t quite understand how they can build without hands! He was equally amazed when watching a squirrel tear the flannel lining off my grill cover and stuff it into his mouth before scampering away to the trees. Nature fascinates Benjamin! Thank-you, Mr. Mike!! I too am amazed at what birds can do using their feet and their bills, whether it is eating or building scratching their heads. Whenever I see an eagle tear into a fish, I have to remember that that powerful beak can also be tender enough to feet a baby eagle. It’s like trying to find a straight 2×4 at Home Depot – they don’t make sticks like they used to. Great photo, Mike. It’s like trying to find a straight 2×4 at Home Depot – they don’t make sticks like they used to. It was interesting to watch as the heron picked up one stick after another and the let them go. When it finally picked up the one it like, it held the stick up high, seemingly testing its balance, before finally taking off with it. Nice! It is fun to watch nest building! That’s a beautiful shot of something you don’t often see. It was a first time for me seeing the heron gathering materials for a nest. I am trying to get out as often as I can in order to observe different behaviors. There are almost an unlimited number of things that happen when we are not around–it’s one of the reasons why I don’t mind returning to the same places over and over again. Yes, I do the same and almost always see something that I missed.